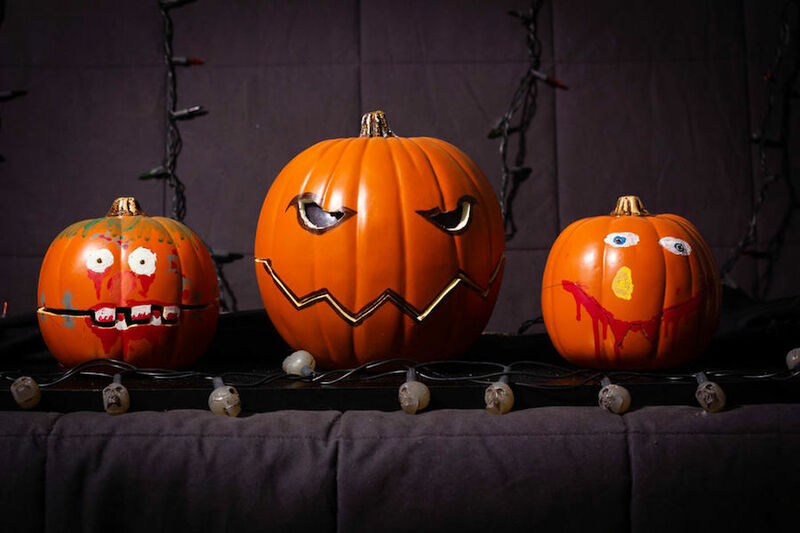 Halloween is just around the corner, and to celebrate, fadecomic decided to set up a trio of singing animatronic pumpkins to belt out scary songs. The project uses a Raspberry Pi for high level control and browser interface, and sends animation commands to an Arduino Uno via USB serial. The Uno takes this data and translates it into actual pumpkin movements coordinated with music. The resulting trio of pumpkins each use their own servo to lift the top of the foam gourd up like a gigantic mouth, and also feature PWM-driven LED eyes. A light show controlled by SSRs completes the spooky musical effect. Build info is available here and the Arduino code can be found on GitHub. Halloween is a great holiday for hacks, bringing out the creativity in even the most curmudgeonly wielder of a soldering iron. [tdragger] was looking to have some good old fashioned Halloween fun, and got to thinking – putting together this great Spooky Eyes build in their attic window. The effect itself is simple – just two glowing orange LEDs spaced the right distance apart, placed in the highest window in the house. As every young child knows, the attic is almost the spookiest room in the house, second only to the basement. Various effects were programmed in to the Arduino running the show, like breathing and blinking effects, to give that frightful character. For maintenance and programming purposes, [tdragger] wanted to have the Arduino remotely mounted, and searched for a solution. Rather than leaning on a wireless setup or something modern and off-the-shelf, instead some old RJ11 telephone extension cables were pressed into service. These allowed the eyes to be placed in the window, allowing the Arduino to be placed in a more accessible location. It’s a basic project, but one that has a good fun factor. Sometimes it’s good to use what you’ve got to hand, so that the buzz of enjoyment isn’t dampened by the long wait for shipping. For something bigger, check out this giant staring eyeball. Automated pumpkin patch to scare trick-or-treaters! Using eight jack-o’-lanterns and an Arduino Mega, “CrankyCoder” built his own automated pumpkin patch. 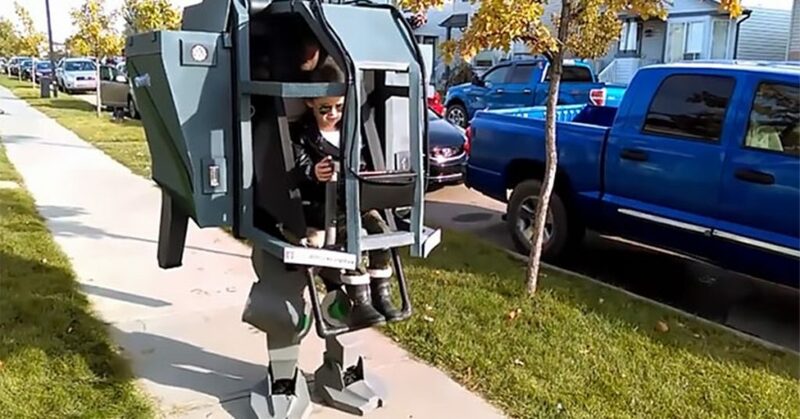 CrankyCoder’s favorite holiday, as well as his family’s, is Halloween. After creating a skull that follows people around a few years ago, he decided to take things up a notch with his “Creepy Pumpkin Patch.” His patch includes eight pumpkins on the edges of a path with homemade pressure switches in between. As trick-or-treaters walk by, the patch is activated, making the pumpkins spin creepily. Cleverly, CrankyCoder employs two pie pans with marbles in between for each rotating pumpkin, creating ball bearings to support the weight. Also, instead of a candle or other complicated electronics, he’s using flickering LEDs from the dollar store to produce a creepy lighting effect. 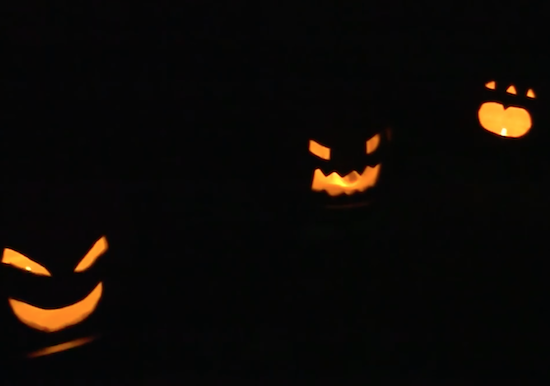 With Halloween just days away, be sure to check out the project’s video seen here or its GitHub page to get started on your own Creepy Pumpkin Patch. "Why worry? Each of us is wearing an unlicensed nuclear accelerator on his back." 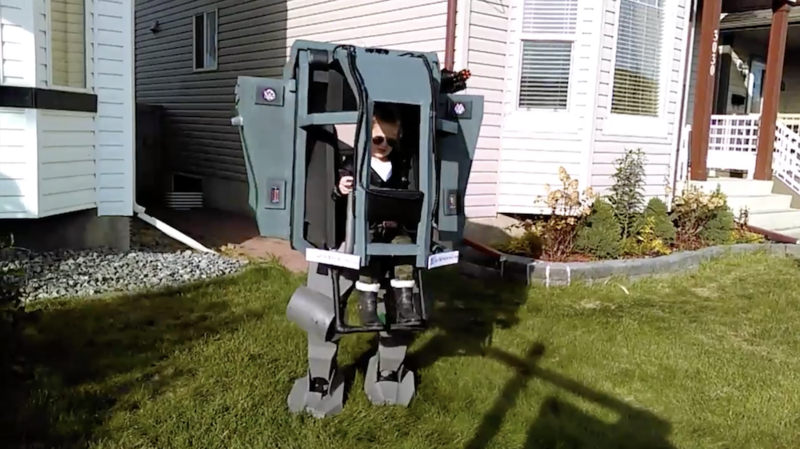 That could be you with this DIY Ghostbusters Proton Pack! The post Check Out This Amazing Ghostbusters Proton Pack appeared first on Make: DIY Projects and Ideas for Makers. [Conor] wired up his 3D-printed coffin doorbell to an array of RGB LEDs, a screaming speaker, and a spinning skull on a cordless screw driver to make a “quick” Halloween scare. Along the way, he included half of the Adafruit module catalog, a relay circuit board, and ESP8266 WiFi module, a Banana Pi, and more Arduinos of varying shapes and sizes than you could shake a stick at. Our head spins, not unlike [Conor]’s screaming skull, just reading through this Rube Goldbergy arrangement. (We’re sure that’s half the fun for the builder!) Smoke ’em if ya got ’em! Start with the RGB LEDs; rather than control them directly, [Conor] connected them to a WiFi-enabled strip controller. Great, now he can control the strip over the airwaves. But the control protocol was closed, so he spent a week learning Wireshark to sniff the network data, and then wrote a Bash script to send the relevant UDP packets to turn on the lights. But that was not fancy-schmancy enough, so [Conor] re-wrote the script in Go. Yes, that’s right — a Go routine on a Banana Pi sends out custom UDP packets over WiFi to a WiFi-to-LED-driver bridge. To make lights blink. Wait until you see the skull. The plastic skull has Neopixels in each ping-pong ball eye, controlled by an Arduino Nano and battery taped to the skull’s head. The skull is cemented to a driver bit that’s chucked in a cordless drill. A relay board and another Arduino make it trigger for 10 seconds at a time when the doorbell rings. Finally (wait for it!) an Arduino connected to the doorbell gives the signal, and sets a wire high that all the other Arduini and the Banana Pi are connected to. Gentle Hackaday reader, now is not the time for “I could do that with a 555 and some chewing gum.” Now is the time to revel in the sheer hackery of it all. Because Halloween’s over, and we’re sure that [Conor] has unplugged all of the breadboards and Arduini and put them to use in his next project. And now he knows a thing or two about sniffing UDP packets. LEDs are the perfect touch to add a creepy red glow to your Halloween props. Make them fade in and out with a simple Arduino sketch. 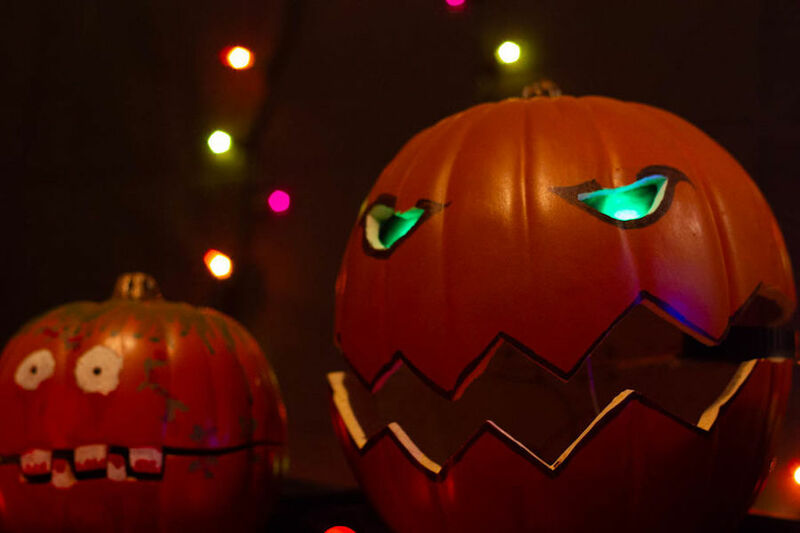 The post Arduino Basics: Add Pulsing LED Eyes to Halloween Props appeared first on Make: DIY Projects, How-Tos, Electronics, Crafts and Ideas for Makers. With some simple programming and a few basic parts, you can rig up a candy vending machine that slides sweets toward you at the push of a button. The post Build an Arduino-Powered Candy Vending Machine appeared first on Make: DIY Projects, How-Tos, Electronics, Crafts and Ideas for Makers. Trick-or-treaters are bound to get a thrill when you make this choreographed music and light display that plays each time your gate is opened. The post Choreograph a Music and Light Display for the Holiday appeared first on Make: DIY Projects, How-Tos, Electronics, Crafts and Ideas for Makers.